Wow! Aurifil thread is my favorite! 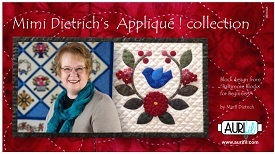 Aurifil is helping me celebrate this year with my own Applique Collection! The box has 12 large spools of beautiful Baltimore colors! Do you collect the Row by Row Fabric License Plates? Add my Celebration plate to your collection by clicking here. This is my year to celebrate! 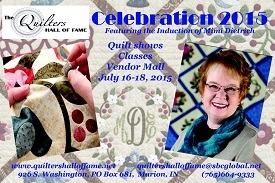 I am The Quilters Hall of Fame 2015 Honoree! Click on the class logos below for a 50% discount! New! Sign up for my newsletter! 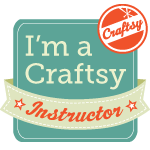 The International Association of Professional Quilters has named Mimi their 2013 Teacher of the Year! 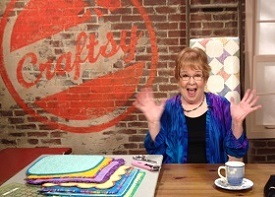 IAPQ publishes The Professional Quilter and hosts the annual Creative Arts Business Summit to support quilters who are serious about their work in the quilt industry. Mimi says, "I am thrilled and very excited about this honor. It's so wonderful to be recognized for doing something I love so much! 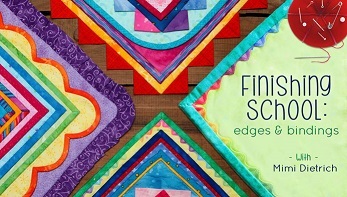 Many thanks to my students who have taught me so much as we've stitched and made quilts for forty years!" One of Mimi's favorite books is Pink Ribbon Quilts- A Book Because of Breast Cancer. In September 2009, with a routine mammagram, Mimi was diagnosed with breast cancer again. Click here to read notes about Mimi's journey. 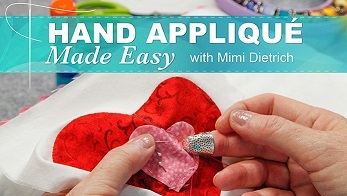 Visit with Mimi as she talks to Annie Smith. Also listen to Mimi's stand-up comic debut at Stoop Stories in Baltimore.